Concept: These are forests associated with active floodplains annually or periodically flooded and enriched by sediment. Vegetation Types (VT) are mainly mixed hardwood forests, often with scattered white spruce. The understory is characterized by a species-rich herb layer and a poorly developed or non-existent bryophyte layer. 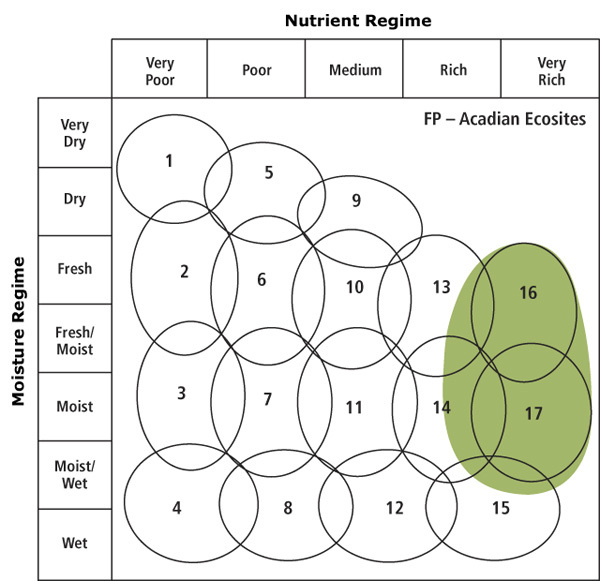 All VTs in this group are found in the Acadian Ecosite group. Vegetation: Vegetation types are mainly closed canopy forests of hardwood including sugar maple, red maple, red oak, white ash, balsam poplar and black cherry. A softwood VT dominated by white spruce occurs on less active floodplains and adjacent terraces. Beaked hazel, chokecherry, wild raisin, ironwood and regenerating tree species are common in the shrub layer. A rich, diverse herb layer usually has meadow rue, several fern species (including ostrich fern), several sedge species, nodding trillium, wood goldenrod and asters. Except for white spruce dominated sites, bryophyte/lichen cover is usually low or non-existent. Environmental Setting: Vegetation types in this group are found on active floodplain sites and occasionally on infrequently flooded terraces and low riparian slopes. Seasonally active channels and small depressions are common providing sites for additional plant diversity. Soils are usually fresh to fresh-moist (but sometimes wetter) and rich to very rich. These alluvium deposits are usually deep, of variable texture and stone free (although gravel layers are often encountered). Earthworms are common in these soils and if an organic layer is present it is usually very thin. This group is prominent in the Northumberland Bras d'Or Lowlands (500) and Valley and Central Lowlands (600) ecoregions, as well as the Inverness Lowlands (320) ecodistrict. It can also be found along some rivers in the Eastern (400) and Western (700) ecoregions. Successional Dynamics:Successional dynamics in this group are not well understood due to a long history of settlement and agricultural activities on these very productive sites. An early pioneer association of willows, cherries, serviceberries and alders may establish on newly created or heavily disturbed sites. Several successional stages are described, leading to a unique climax forest comprised of shade tolerant hardwoods including sugar maple, red maple and white ash. Elm was once a significant part of this forest, but has been almost wiped out in natural habitats by Dutch elm disease. Older forests of red maple and red oak are also known. Flooding, channelization, ice scour, insects and disease are potential disturbance agents. Ecological Features: Flooded forests have the highest landform, structural and species diversity of any forest group in Nova Scotia. This inherent complexity originates with regular flooding events and the associated deposition and erosion of stream sediment. Flood cycles also recharge nutrient and water reserves, producing extremely rich soils and inherently dynamic and productive forests. Ecosystems in this group feature numerous microhabitats including seasonally active channels, vernal pools, levees and ox-bow ponds. Many wildlife species spend all or parts of their lives in these riparian forests. Those with the highest affinities include several rare plants, birds (e.g. grey catbird, yellow warbler, ovenbird, northern waterthrush, mourning warbler, common yellowthroat, Wilson's warbler and northern oriole), amphibians (e.g. wood frog), reptiles (e.g. wood turtle), mammals (e.g. mink, otter, muskrat and several bat species) and invertebrates. Old growth forests composed of very large, tall trees will develop on the less active floodplains with strong sugar and red maple composition. Patch size is variable and most stands have been strongly truncated by past land use.